Iran is a big country and planning an Iran itinerary can be daunting, especially given that most people (including us before we left) have only ever heard of Tehran. Whether you have a one or two weeks in Iran or plan on extending your tourist visa and spending a couple of months there, this guide will give you an overview of all the best places to see in Iran and how long to spend in each allowing you to plan the perfect Iran itinerary for your time frame. 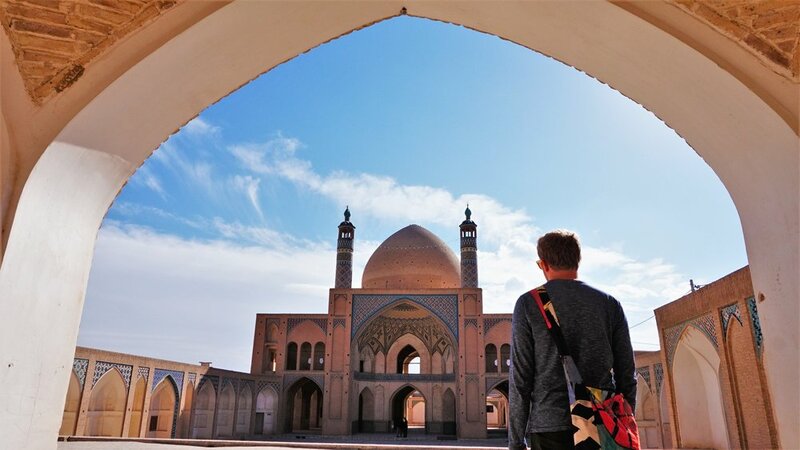 If you're planning to travel independently make sure you read our guide to backpacking and independent travel in Iran for all the logistical information about transport, accommodation, money and more. How long do you need to travel Iran? Two weeks in Iran is a good amount of time to get a feel for the country, visit some of the major sights and not be rushing around the country like a headless chicken. But there is so much more to see and it's always nice to plan some rest days. We spent a month in Iran and travelled from north to south, although it's totally possible to spend months exploring this vast and diverse country. Iran's climate varies greatly from north to south although it is sunny almost all year round. Tehran and the north get bitterly cold in winter and experience snow while this is the perfect time to be in the Persian Gulf with day time temperatures sitting around 25°C. Avoid the unrelenting heat of summer (June-August) especially if you're female and will need to wear a head scarf outdoors! We were in Iran in November and December which was mostly pleasant during the day and getting cold at night. We travelled north to south so as to avoid winter in the north. Public transport in Iran is excellent and runs regularly and mostly on time. Distances can be long though so consider overnight transport to save time and money. Overnight buses in Iran are very comfortable and affordable (around €10) and there are also overnight trains between some cities. If you want to book tickets in advance and pay with an international credit card, check out 1stQuest. If you are on a tight time schedule or you need to get back to Tehran at the end of your travels you may want to fly. Domestic flights in Iran are cheap and frequent and almost every city has an airport. Tickets are much cheaper and easier to purchase once you're in Iran. See red points on map. One week is quite a short time in Iran considering flight and visa costs. But if that's all you have you will be able to see some of the top spots in Iran and save some of the more remote areas for your next trip! Most visitors to Iran will start or end their trip in Tehran. Huge, polluted and bursting with life Tehran will draw you in or make you want to get out fast. We didn’t fall for Tehran and don’t feel like we missed much by only spending two days there. But if big cities are your thing there’s plenty to be explored. We loved the tiles at Golestan palace, walking the nature bridge and surrounding parks and a visit to the Book Garden - Tehran’s largest bookshop including cafes and science exhibitions for kids. We really liked Esfahan. All the convenience of a city with plenty of shops, restaurants and tourist attractions. But also a relaxed vibe and a centre that’s easy to walk around. Esfahan is quite liberal and there are lots of young people out and about. 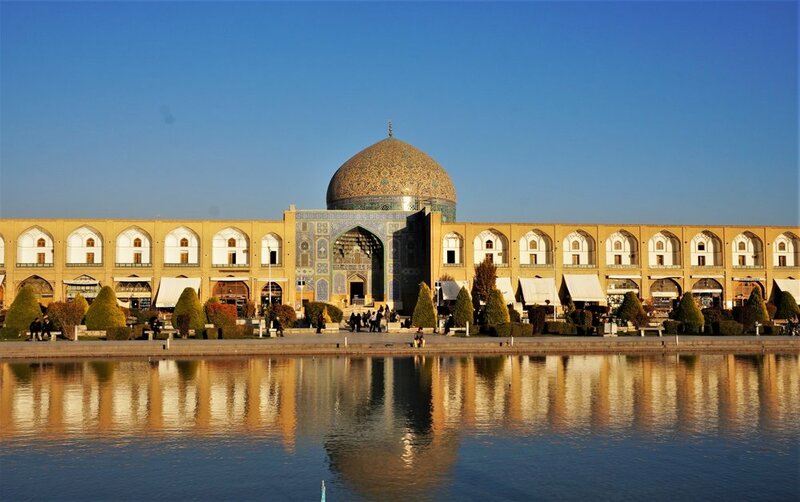 The main attractions are ­­­Naqsh-e Jahan Square and the bridges. The river is only filled with water for 3 months of the year so you might be lucky to see it in it’s full beauty. If not, the bridges are still interesting to see. Make sure to visit the Khaju bridge in the evening and listen to be singers making use of the unique acoustics under the bridge. 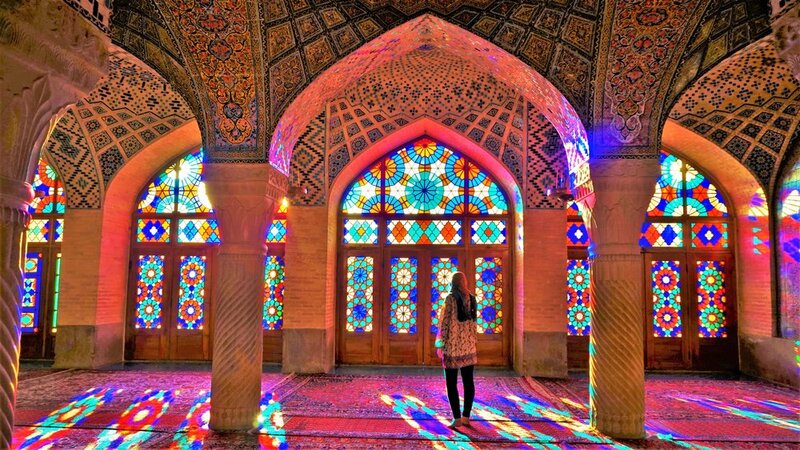 This is Iran’s most popular tourist city and home to the Pink Mosque. There are plenty of other tourist attractions in the city which makes for a lot of group tours, touts and overpriced entrance fees. There are some beautiful things to see but we much preferred other areas of the country for exploring and relaxing. *Visit the Pink Mosque in the morning before the tour groups arrive. Sunrise is also the most beautiful time as the light comes through the stained glass. Located about an hour away from Shiraz, these world heritage site ruins are a great way to discover ancient Persia. It’s possible to see the complex as a day trip from Shiraz with or without a tour guide. Or you can arrange a driver to take you here on the way to Yazd. It can take between 2 and 5 hours to explore the complex depending on your level of interest and pace. For more information about the site and what to expect there as a tourist read this article about visiting Persepolis. See red and yellow points on map. Two weeks seems to be the standard time to spend in Iran. It's enough time to make it to all of the major destinations, get a good feel for the country and enjoy some down time. So as well as the places in our one week Iran itinerary, make sure you find your way to these. Little Kashan is usually just a day stop for tourists heading further south. This is enough time to do a quick round of the sights but the town has a really chilled vibe and there’s enough to do over 2 or even 3 days. The historic houses are a must see, you can pay individually (150,000 IRR) or get a combined ticket (400,000 IRR) for three houses. We decided only to pay for the bathhouse and the hotel which is only 50,000 IRR. The staff are known to offer discounts so if it’s quiet ask for a 2 for1 or special discount. If you’re after a Western standard coffee head to Mr Coffee Kashan, where this mustachioed local makes a range or artisan coffees. The Fin Gardens were closed for renovations while we were there but they’re a popular attraction for a day trip. We took a day tour which included a visit to an ancient underground village, the impressive Aran va Bidgol shrine, some underwhelming castle ruins, salt flats, sunset in the desert, a caravanserai and then dinner. For €35 for two this was a great value way to see lots of the area. We stayed at Sana Historical House which was very comfortable and had great breakfast. €30 for double room with ensuite and breakfast or €15 in a dorm. We loved our stay in this peaceful little desert town. Mostly it was thanks to our amazing host at Yazd Rest-Up Hostel who kept us fed, entertained and informed throughout our stay. 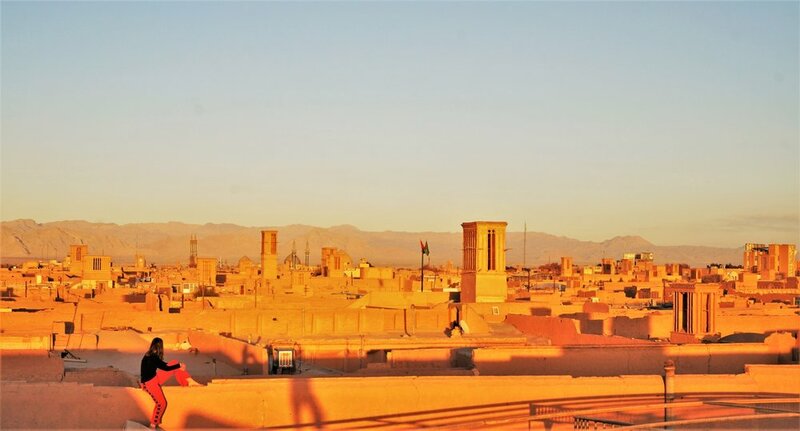 There are a few attractions to see in Yazd such as the Jame Mosque but the most interesting part is getting lost in the mud brick lanes and finding rooftop views of the wind towers. From Yazd you can head out hiking in the surrounding mountains or take a tour to the towers of silence, an ancient Zoroastrian burial site. See red, yellow and green points on map. In three weeks you can make your way all the way to the south of Iran and see some of our favourite places in Iran, the islands! We were so fascinated to find out about the islands of the Persian Gulf and knew we had to see them. You'll probably want to book a flight back to Tehran if you need to end your trip there and from Shiraz or Yazd you can make your way past these locations. We didn’t make it to this area as we were offered a stay in Sirjan and went to learn about the flour mill business and pistachio farming from a Couchsurfing host. Kerman is a small desert town and there is not a huge amount to see but it is a good place to access Bam. The ancient citadel of Bam was severely affected by an earthquake in 2003 and is still being rebuilt. Although not restored to it's former glory, the town itself is still interesting to see with houses made from mud and built into the earth. This bustling port city doesn’t offer much more than a day of wandering but is a necessary stop if you’re taking a ferry to the islands. This tiny island will make you feel like time has stopped. Just 30km around, little Hormuz is a land of geographical wonders, secluded beaches and a laid-back local village. The sights can be seen in one busy day but you’ll want to spend longer soaking up the chilled vibes on this forgotten island. Qeshm Island is bigger and busier than Hormuz but every bit as intriguing and beautiful. The Qeshm Island GeoPark includes sights such as the world’s longest salt cave, dolphin watching and incredible canyons. Definitely leave yourself a few days to explore everything Qeshm has to offer. Make the most of your 30 day visa or even extend it for up to three months (total) and you have time to see a lot more of the far flung corners of Iran. Some of these places are great stops if you're entering or exiting Iran overland from Azerbaijan, Armenia or Turkmenistan. There are also many places in the far West and East of Iran but because these are near the borders make sure you check current situations. Walking down the main street of Rasht you might think you’re in Europe. The town has a very relaxed feeling, lively evening street life and some cool statues. You could easily spend a couple of days relaxing in Rasht but the real draw card is the surrounding areas. Day trips to the stepped village of Masouleh and hiking around the mountain village of Olsabelangah were highlights of our stay. There is also Rudkhan Castle which is a popular day trip. For all of these trips you’ll need to pass through the town of Fuman, famous for its delicious cookies. Make sure to stop and try them! An overnight bus ride from Tehran or your first stop crossing the border from Armenia or Azerbaijan is Tabriz. Home to the world’s largest indoor bazaar and also a base for visiting the cave town of Kandovan. We didn’t make it this far north but we heard good things so if you have spare time in your Iran itinerary or you’re arriving by land border then definitely consider a stop here. This is another area we didn’t make it to but is on our list for next time. Located in the far North East near the Turkmenistan border this is the centre of Islam in Iran and the second biggest city. The main attraction is a huge shrine visited by thousands of worshippers every day. You can get here by flight or overnight bus from Tehran. The whole of Iran is very untouristed but this area, in particular, sees very few Westerners.